School started today!! Here in Michigan, public schools start after Labor Day. I know people who have been in school for almost a month now! I’ve been more diligent about filling out my calendar with absolutely everything and it’s already filling up quickly. I love being busy, as long as I stay on top of it all! Top priority on my list for this month is to start meal planning for weekdays. I figure an hour or so prepping on Sunday is worth it so we can have effortless meals when we are busy. Every Sunday, I head to Walmart to pick up my newspapers (they’re only $1.50 there!) and I check off my shopping list for the week. This week, I beelined right to the deli to get some rotisserie chickens! Did you know they offer them both cold and hot for $4.98? Walmart offers a meal deal that includes a 2 pound side of cole slaw, potato or macaroni salad, 2L of Coke and a hot rotisserie chicken for under $10! SUCH a great deal, especially to pick up on the run. Aside from the meal deal, I got 2 cold chickens to shred for lunch salads and our favorite tortilla soup. They have pre-made sandwiches in the deli area that are stuffed with tasty meat and cheese….I had a plan for those too! This summer, after t-ball we stopped at Walmart for dinner. 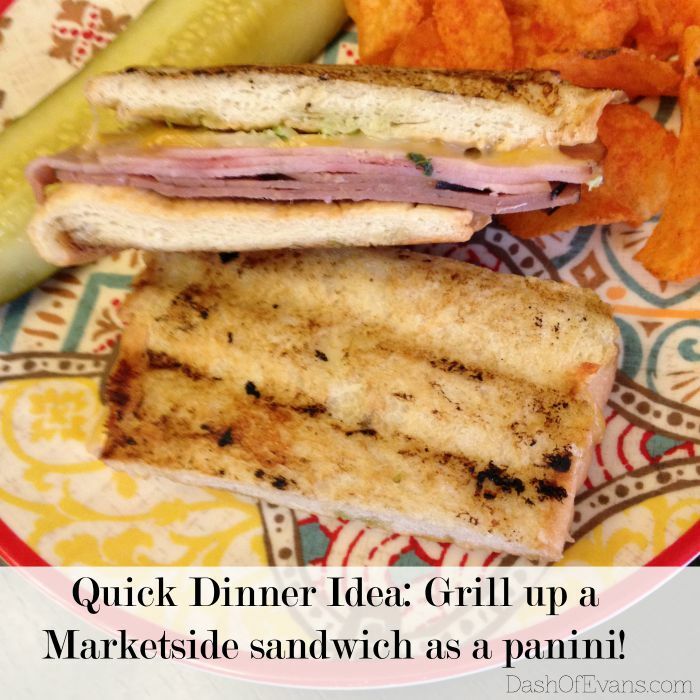 Without any ideas in mind, I spotted the Marketside sandwiches and immediately thought to make paninis. We had dinner ready before the girls had changed out of their t-ball uniforms. They also offer a Marketside pizza deal which includes a 2 liter of Coca-Cola product–those are also great for a quick and tasty meal! The Marketside sandwiches come in a small or large size and at least 6 different varieties. The large is WAY over a foot long, the size of a French loaf and it feeds our whole family for only $5.98! To make it into a panini, simply discard the lettuce and flip the bread. To get it extra crispy, just add some mayo to the outside before throwing it onto the Foreman Grill. If you don’t have an indoor grill, you can press it between two pans too! On the inside of one side of the bread, I add pesto. 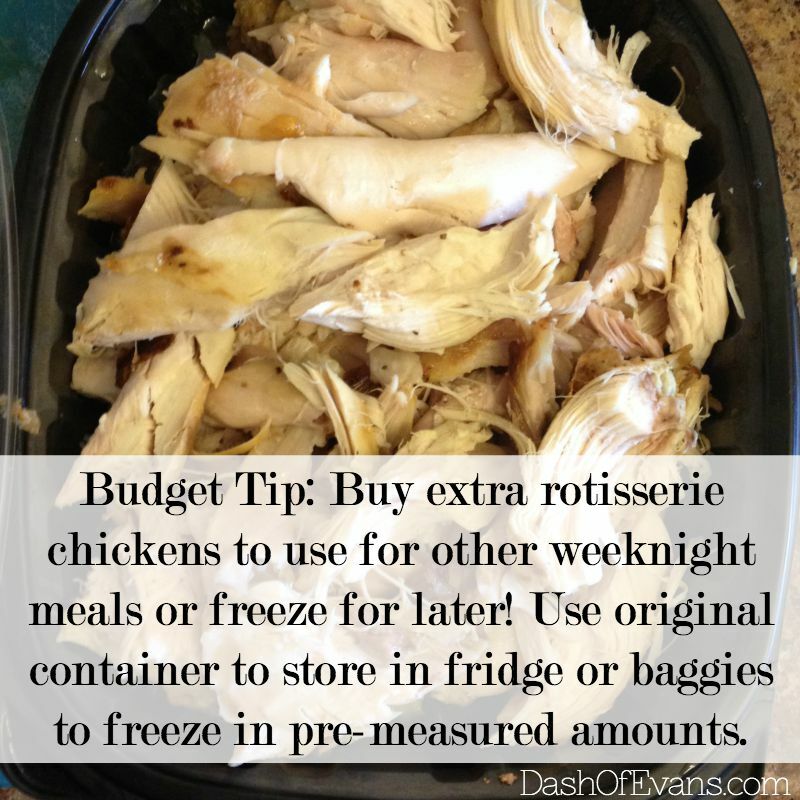 Did you know rotisserie chicken is a GREAT budget saver? Buying 2-3 at $4.98 each is much cheaper than getting raw chicken from the meat section, unless there is a huge markdown. Having it already cooked saves TONS of time too. You are guaranteed juicy chicken! I shred it and store it in the container it comes in. Save the juices on the bottom, too! I store 3/4 of it in the fridge for weekly salads and measure the remaining to freeze–labeling it really helps! If you follow me on SnapChat (CheapAsh), you may have noticed I was meal prepping up a storm yesterday. Making a large batch of soup weekly is a timesaver for many reasons. First of all, it provides at least 2-3 lunches! I also tend to freeze at least half of the batch. If you make a variety of soups for a month, you have an additional month in the freezer! Stay tuned for my FIRST meal plan coming later this week. The tortilla soup will be on there. 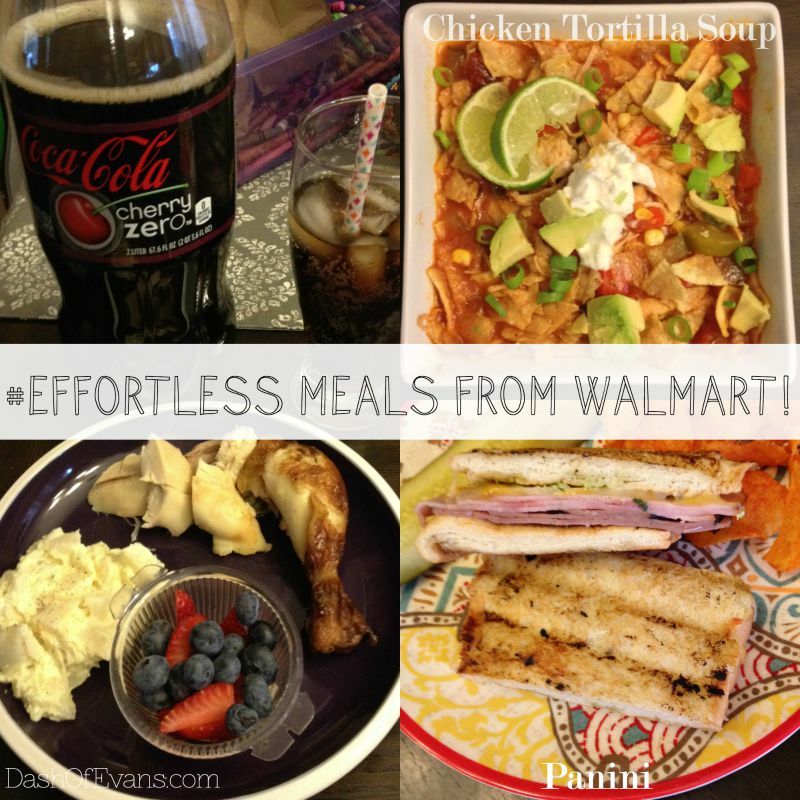 Be sure to check out more delicious effortless meal inspiration. How would you pair Marketside products with Coca-Cola? You are not the first person I've heard rave about rotisserie chickens – I need to get on this bandwagon. I love how you personalize each recipe. 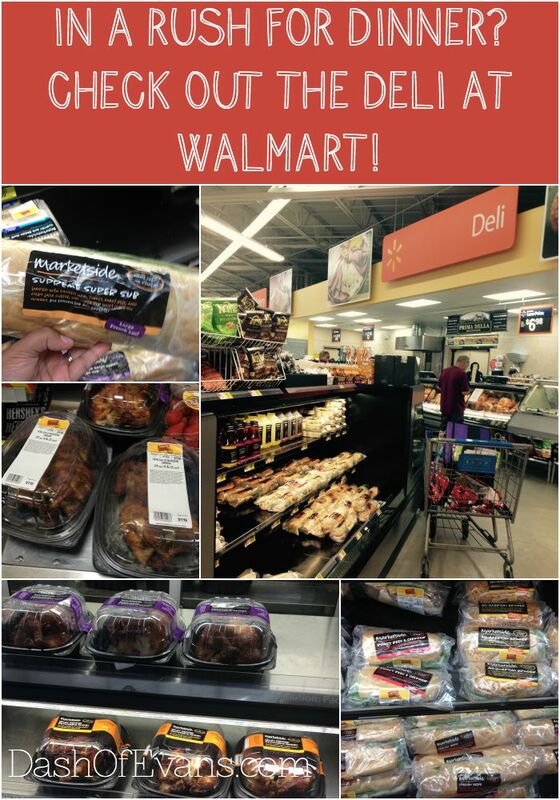 Who knew Walmart had a deli?! Sounds like a great recipe. I LOVE rotisserie chicken. I love to buy Rotisserie chickens. I bought one this week for dinner then I made chicken enchiladas with the leftovers. I found chickens a day old one day (in a cooler) at Walmart for less than $3 and it made great chicken salad. What a meal! Thanks for sharing your recipe! We've been back to school for over a month. That looks great. We are a Coke family. One of my kids likes Pepsi, that is like a bad word, lol.